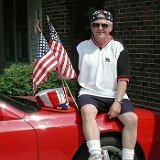 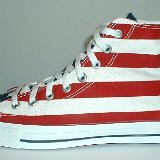 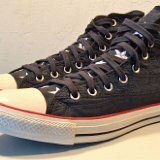 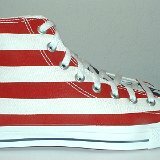 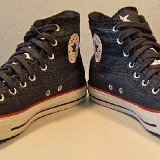 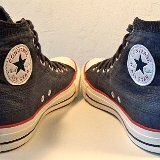 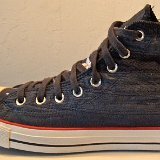 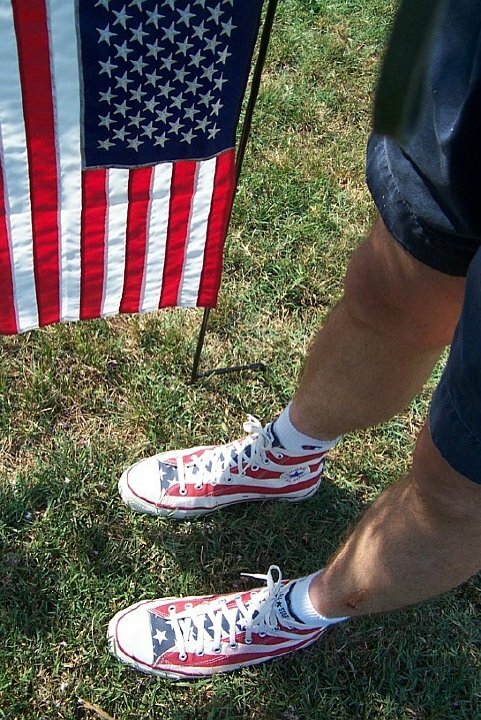 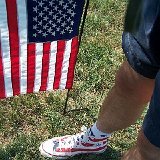 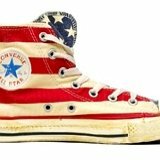 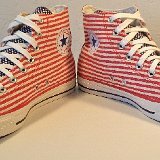 Photo gallery of chucks that have flag print canvas uppers. 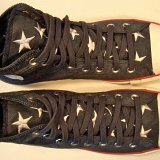 1 Flag Pattern Chucks Black and white stars and bars high tops, angled front view. 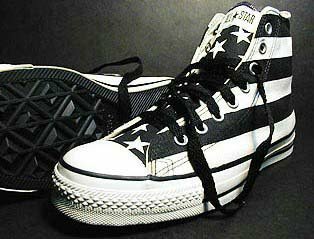 2 Flag Pattern Chucks Black and white stars and bars high tops, right inside patch and sole views. 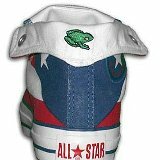 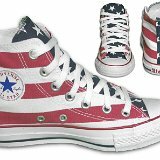 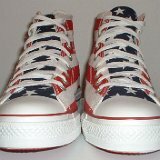 3 Flag Pattern Chucks Black and white stars and bars high tops, left outside and sole views. 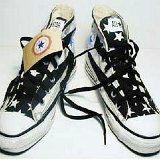 4 Flag Pattern Chucks Black and white stars and bars high top, left inside patch view. 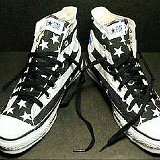 5 Flag Pattern Chucks Black and white stars and bars high tops, top view. 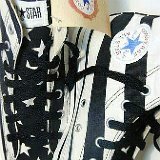 7 Flag Pattern Chucks Black and white stars and bars high top, inside patch view. 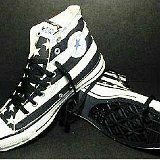 8 Flag Pattern Chucks Black and white stars and bars high tops, angled side view. 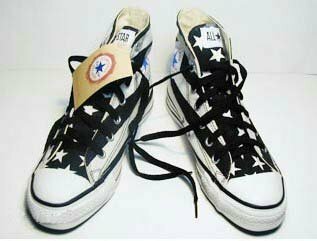 9 Flag Pattern Chucks Black and white stars and bars high tops, rear and inside patch views. 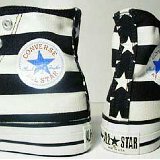 10 Flag Pattern Chucks Black and white stars and bars low cut, angled top view. 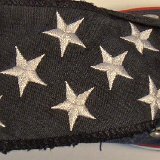 11 Flag Pattern Chucks Black and white stars and bars low cut, showing closeup of the heel patch. 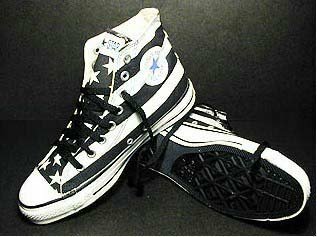 12 Flag Pattern Chucks Black and white stars and bars low cut, top view. 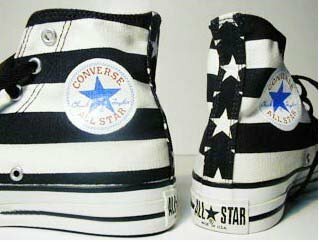 13 Flag Pattern Chucks Black and white stars and bars low cut, angled side view. 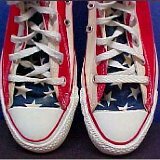 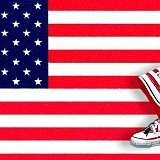 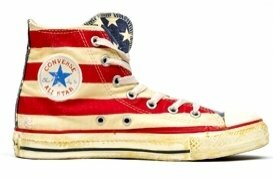 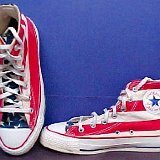 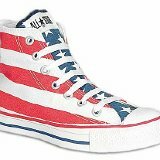 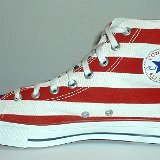 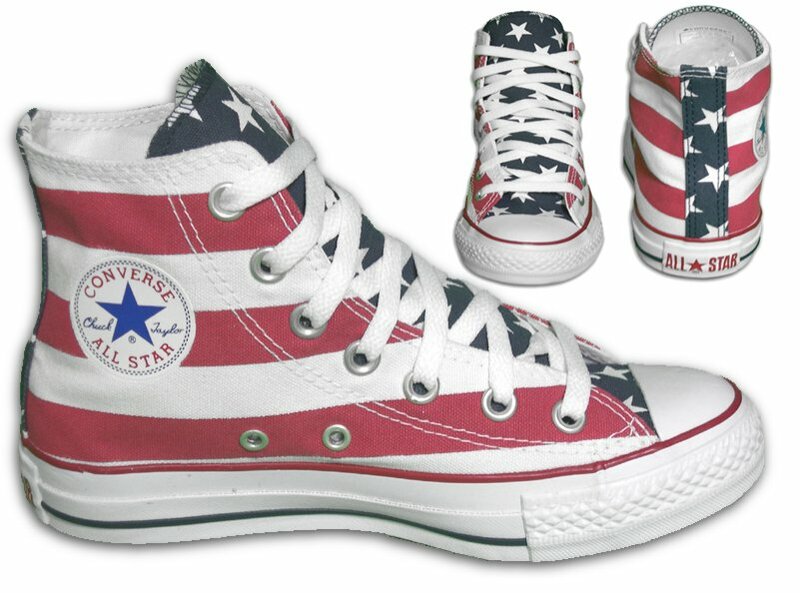 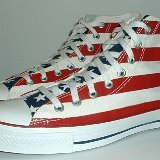 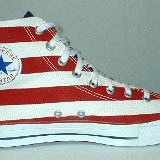 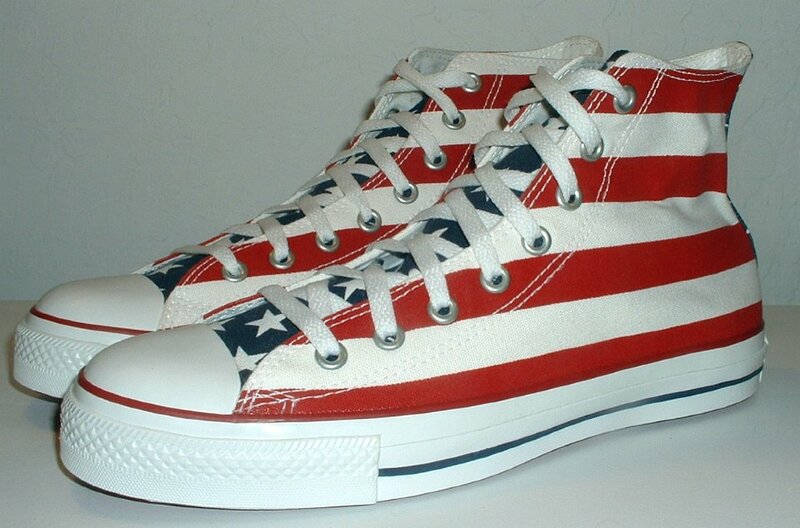 14 Flag Pattern Chucks Stars and bars high tops superimposed on their inspiration, an American flag. 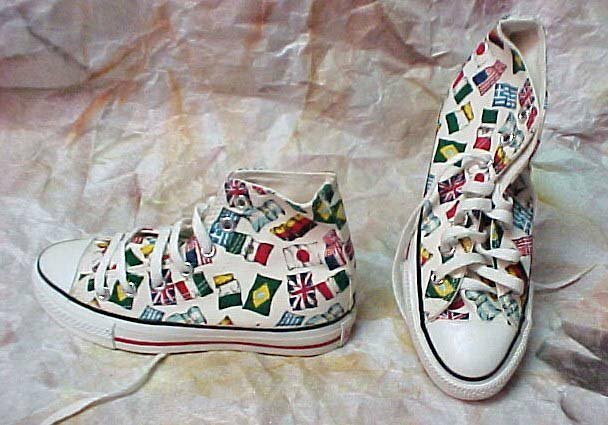 15 Flag Pattern Chucks International flags pattern high tops, side view. 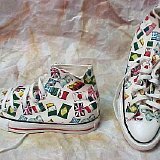 16 Flag Pattern Chucks International flag pattern high tops, angled side view. 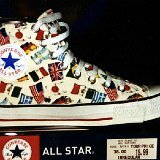 17 Flag Pattern Chucks Left international flag pattern high top, inside patch view on its box. 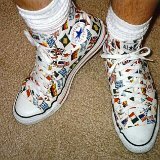 18 Flag Pattern Chucks International flag pattern high tops, top and outside views. 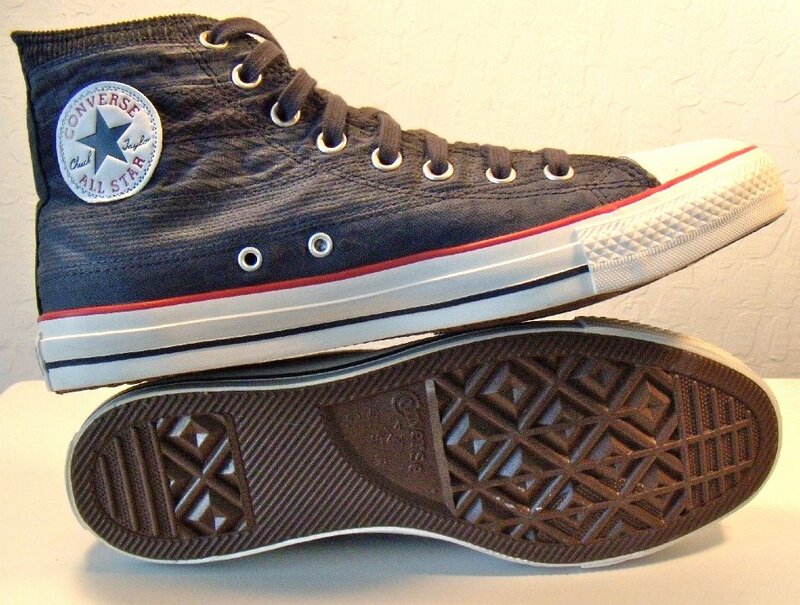 19 Flag Pattern Chucks Inside patch view of a right blue flag Americana high top chuck. 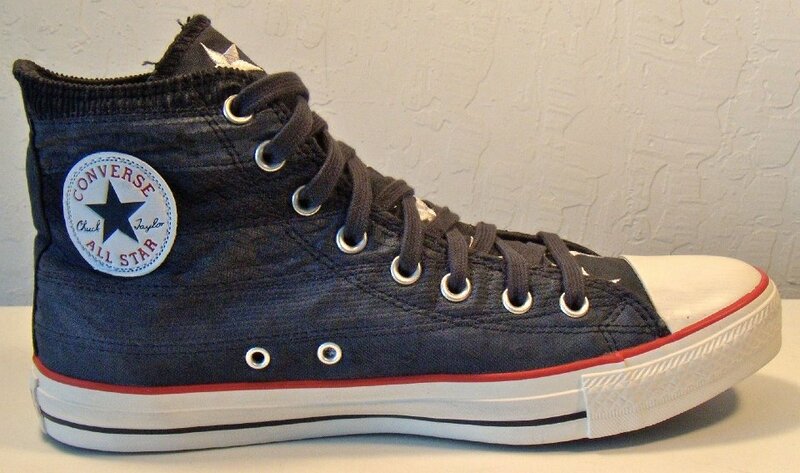 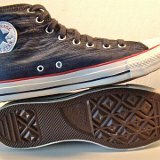 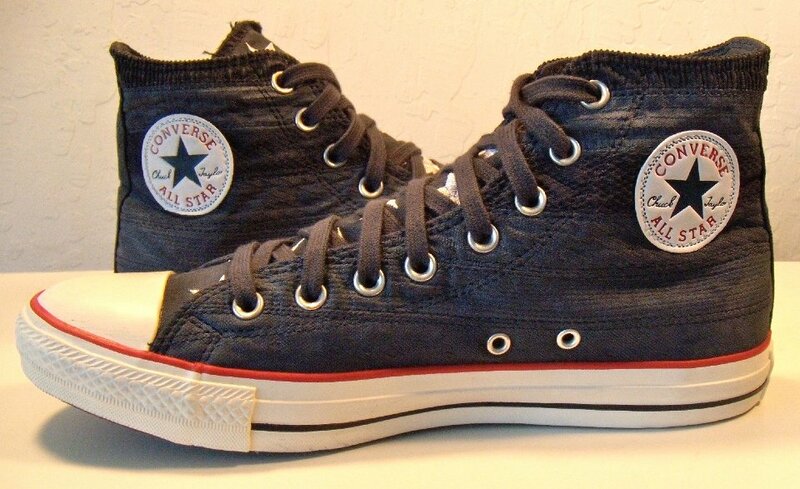 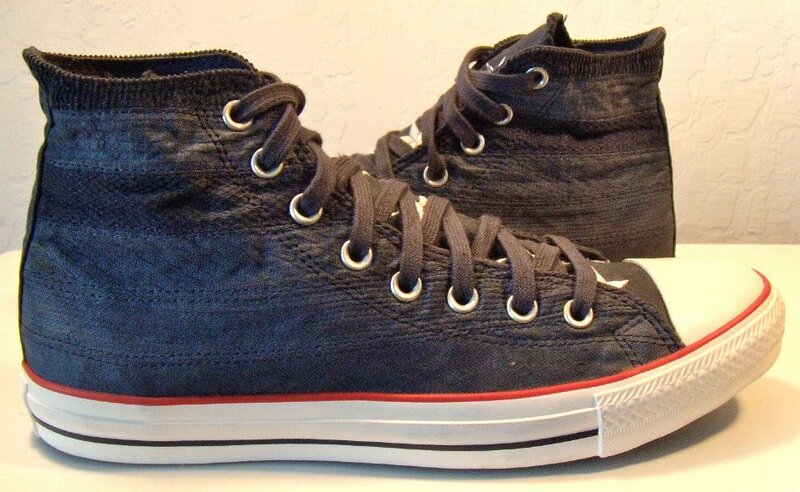 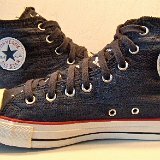 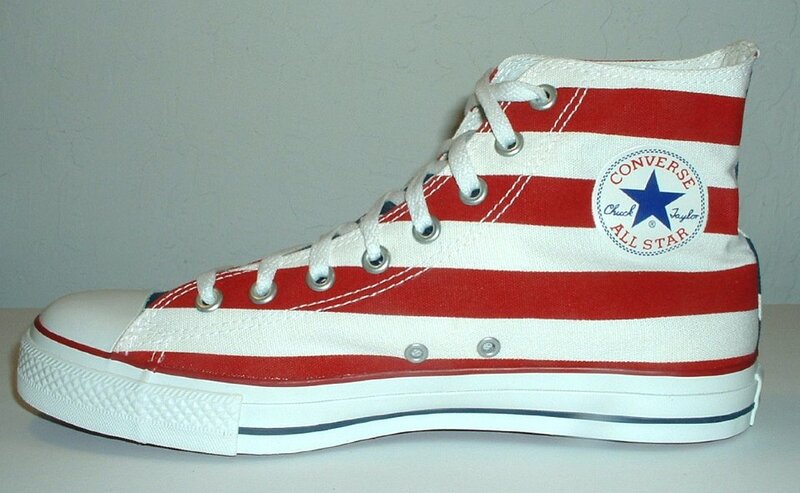 20 Flag Pattern Chucks Outside view of a right blue flag Americana high top chuck. 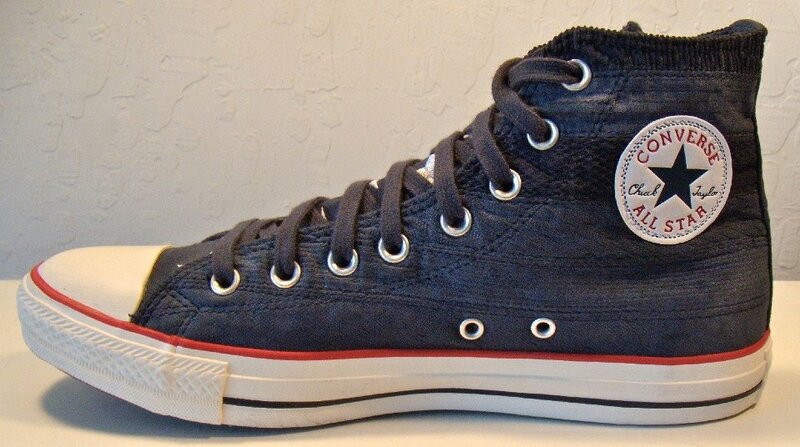 21 Flag Pattern Chucks Inside patch view of a left blue flag Americana high top chuck. 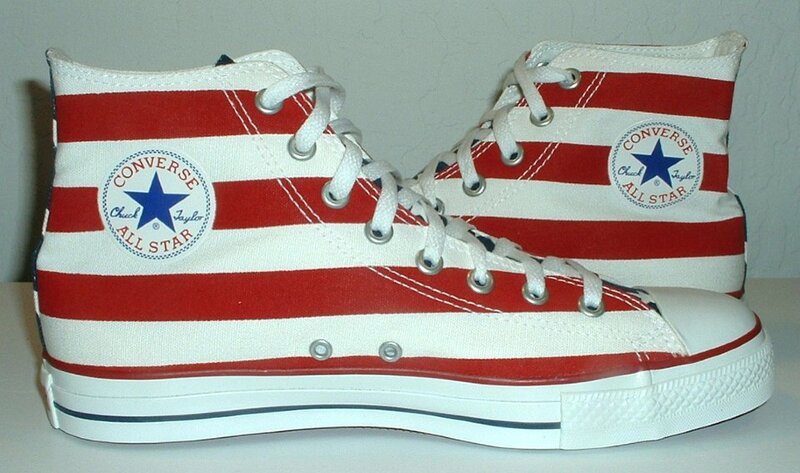 22 Flag Pattern Chucks Outside view of a leftt blue flag Americana high top chuck. 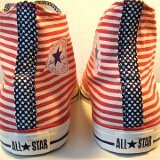 23 Flag Pattern Chucks Rear view of blue flag Americana high top chucks. 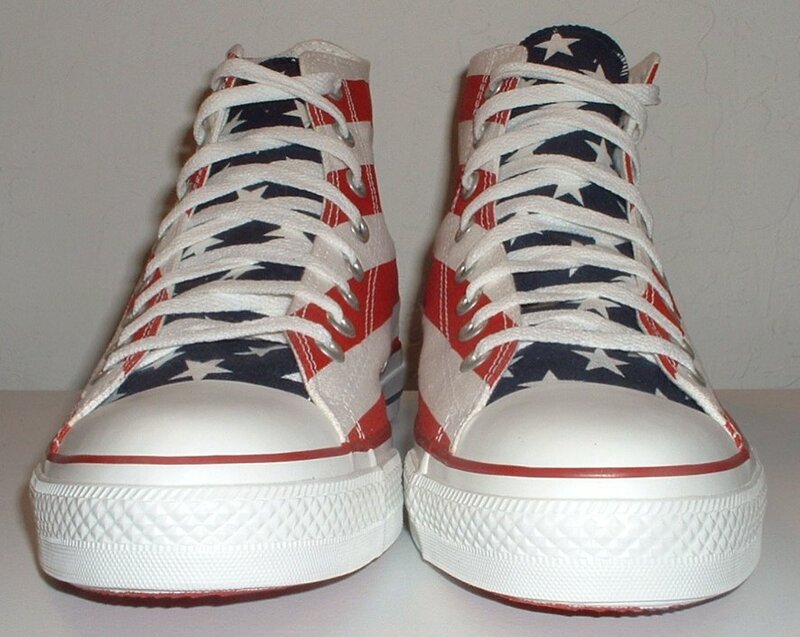 24 Flag Pattern Chucks Angled rear view of blue flag Americana high top chucks. 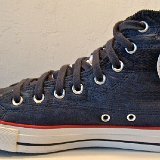 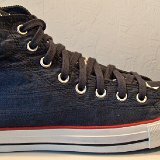 25 Flag Pattern Chucks Angled side view of blue flag Americana high top chucks. 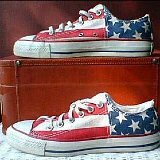 26 Flag Pattern Chucks Front view of blue flag Americana high top chucks. 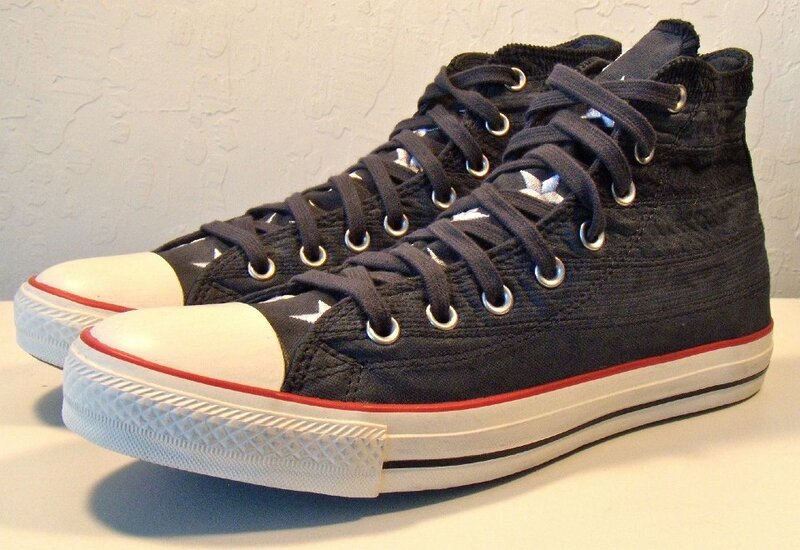 27 Flag Pattern Chucks Angled front view of blue flag Americana high top chucks. 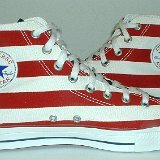 28 Flag Pattern Chucks Top view of blue flag Americana high top chucks. 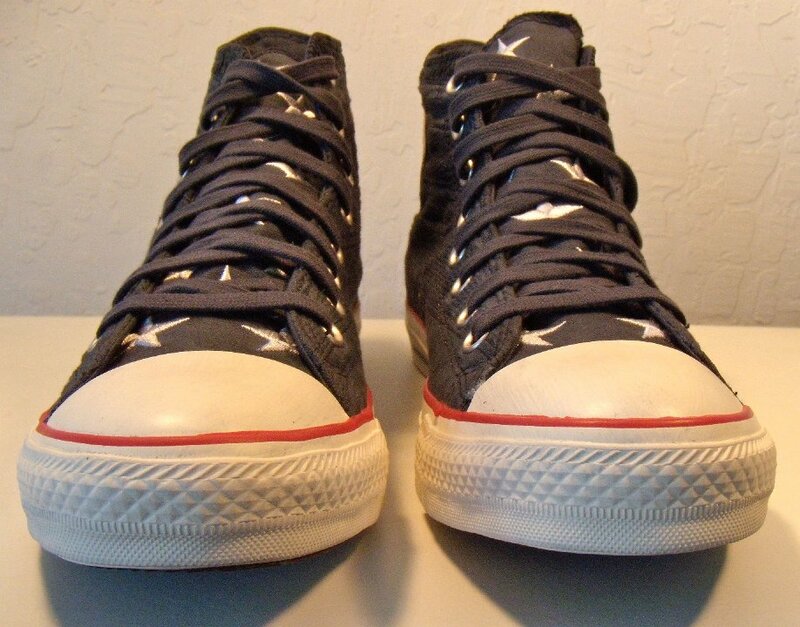 29 Flag Pattern Chucks Inside patch views of blue flag Americana high top chucks. 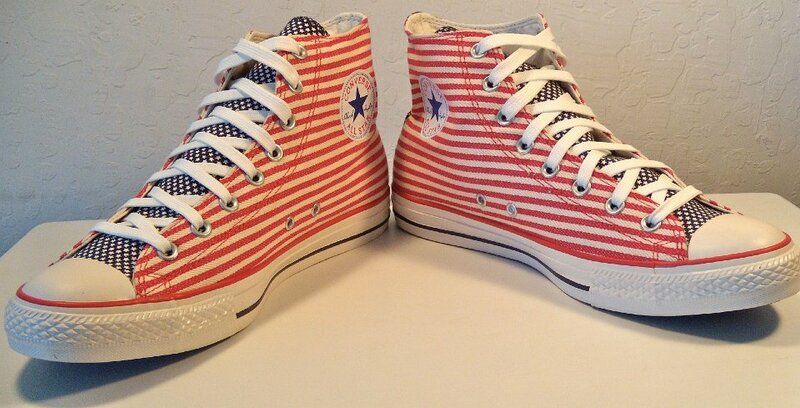 30 Flag Pattern Chucks Outside views of blue flag Americana high top chucks. 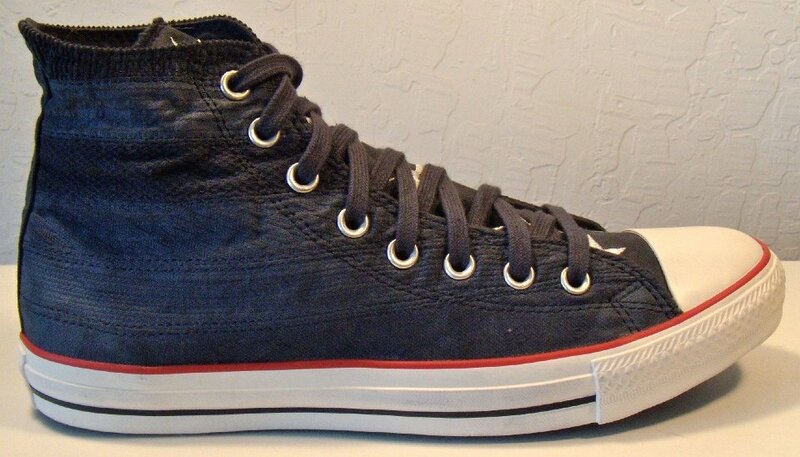 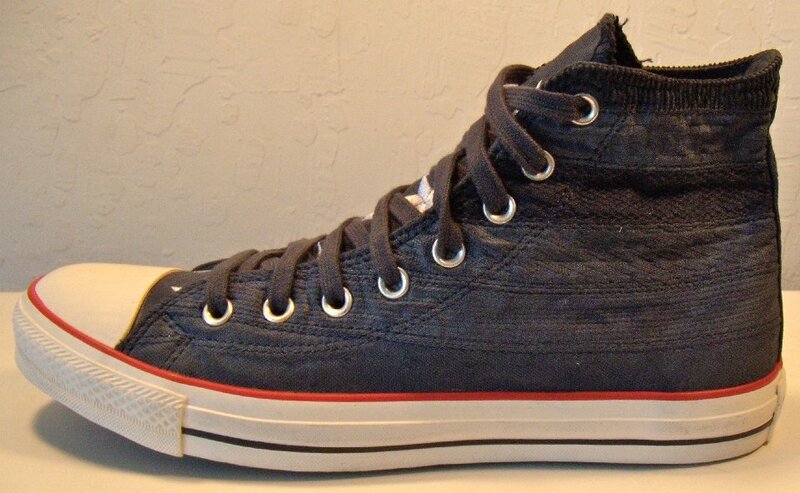 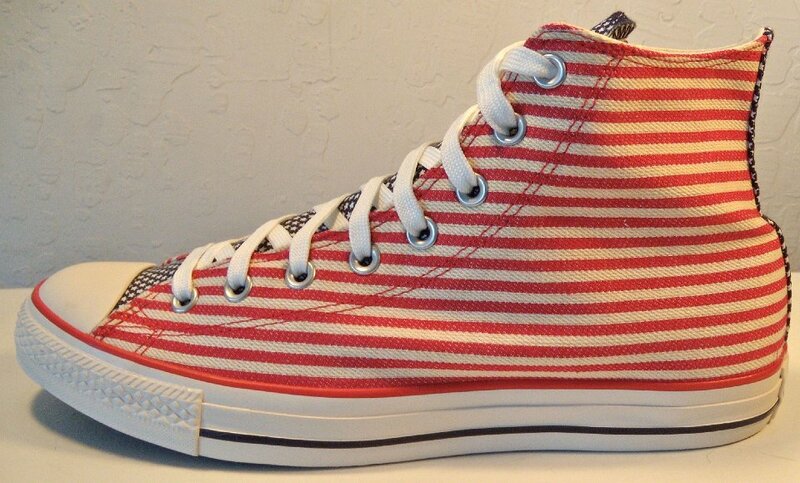 31 Flag Pattern Chucks inside patch and sole views of blue flag Americana high top chucks. 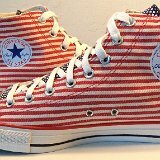 32 Flag Pattern Chucks Close up of the tongue of a blug flag Americana high top chuck. 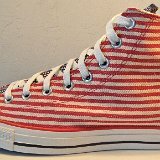 33 Flag Pattern Chucks Close up of the insole of a blug flag Americana high top chuck. 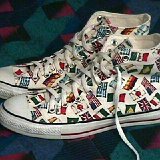 34 Flag Pattern Chucks Puerto Rican flag foldover high tops, inside patch and rear foldover view showing embroidered frog. 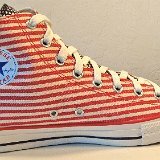 35 Flag Pattern Chucks Closeup of the embroidered frog foldover on the Puerto Rican flag high top. 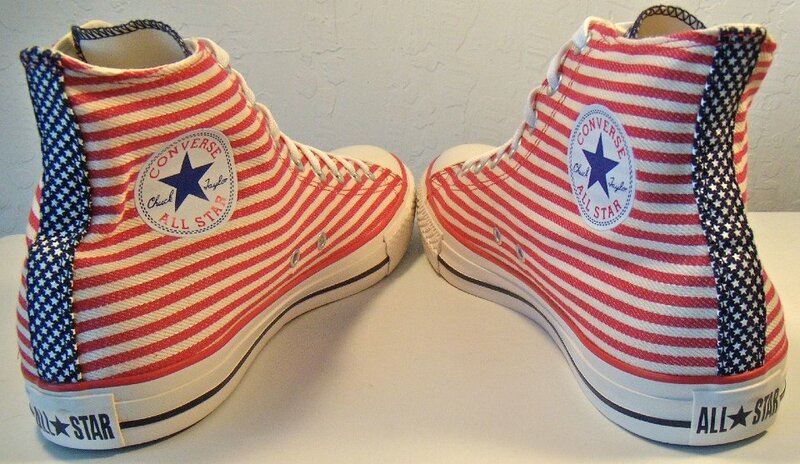 36 Flag Pattern Chucks Inside patch view of a right red and white striped Americana high top chuck. 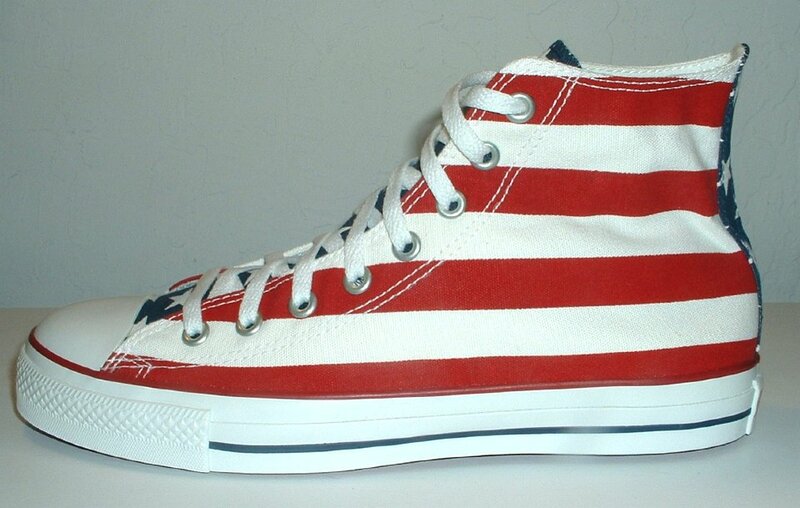 37 Flag Pattern Chucks Outside view of a right blue flag Americana high top chuck. 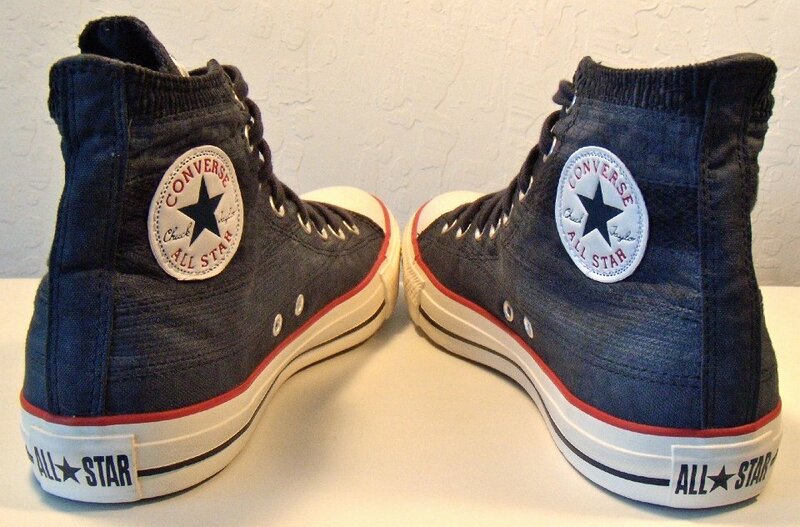 38 Flag Pattern Chucks Inside patch view of a left blue flag Americana high top chuck. 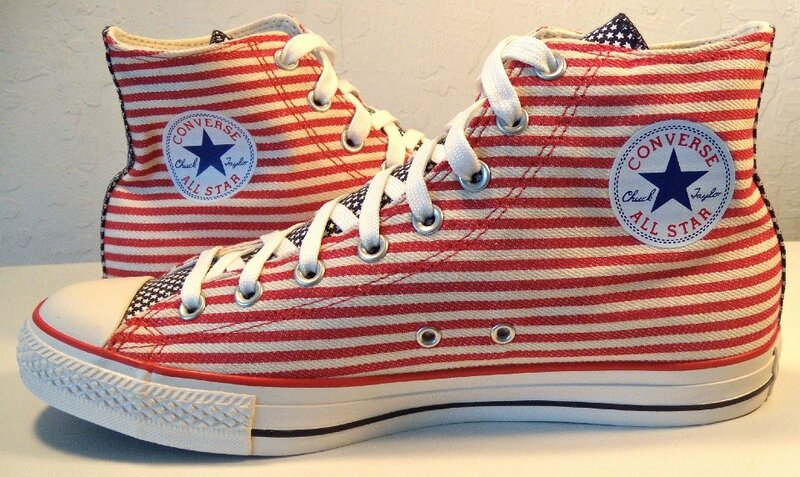 39 Flag Pattern Chucks Outside view of a leftt blue flag Americana high top chuck. 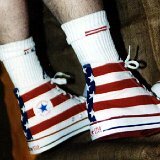 40 Flag Pattern Chucks Rear view of blue flag Americana high top chucks. 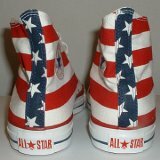 41 Flag Pattern Chucks Angled rear view of blue flag Americana high top chucks. 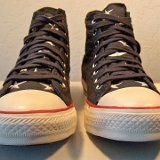 42 Flag Pattern Chucks Angled side view of blue flag Americana high top chucks. 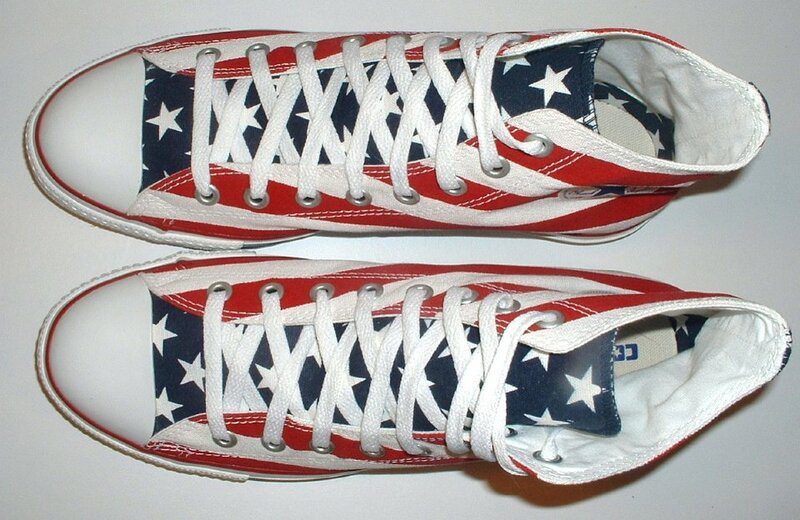 43 Flag Pattern Chucks Front view of blue flag Americana high top chucks. 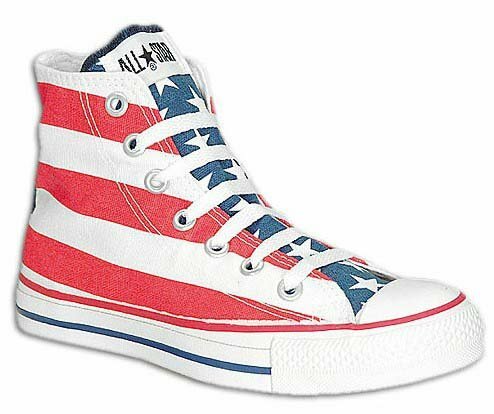 44 Flag Pattern Chucks Angled front view of blue flag Americana high top chucks. 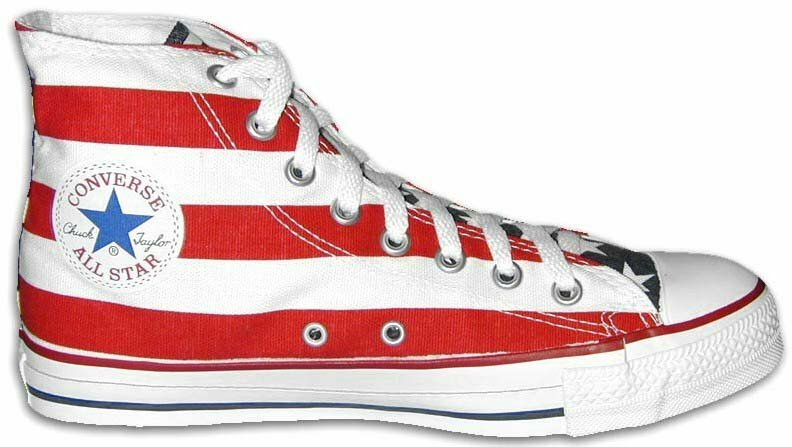 45 Flag Pattern Chucks Top view of blue flag Americana high top chucks. 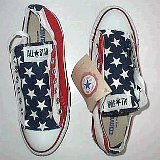 46 Flag Pattern Chucks inside patch views of blue flag Americana high top chucks. 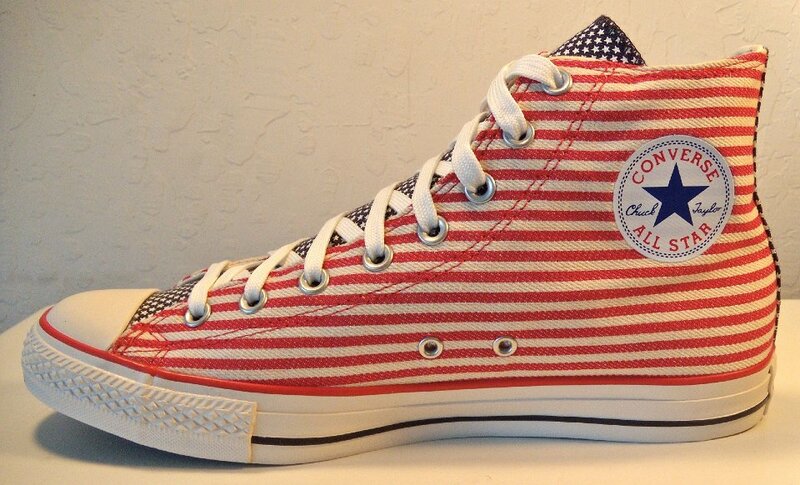 47 Flag Pattern Chucks Outside views of blue flag Americana high top chucks. 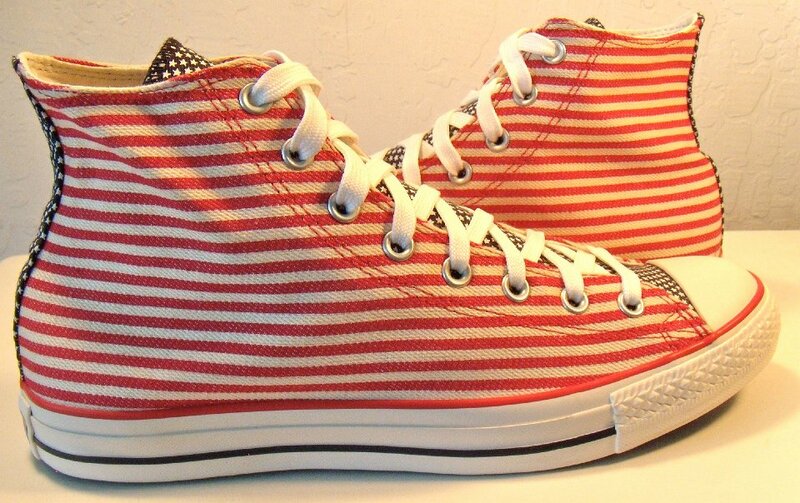 48 Flag Pattern Chucks inside patch and sole views of blue flag Americana high top chucks. 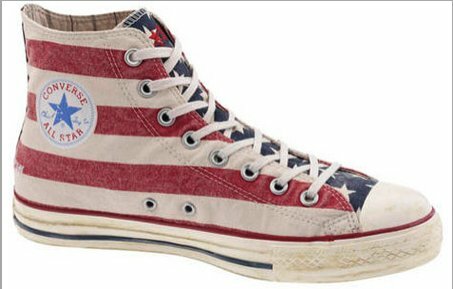 49 Flag Pattern Chucks Left "rummage" stars and bars high top, shown in an inside patch view, a rear view, and a sole view. 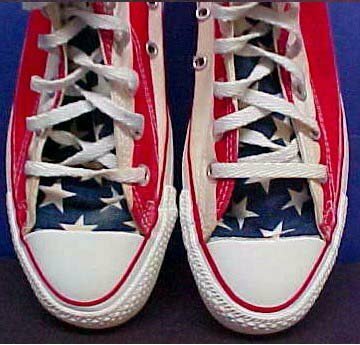 50 Flag Pattern Chucks Inside patch view of a left stars n bars high top. 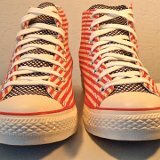 51 Flag Pattern Chucks Stars and bars high tops, angled side view. 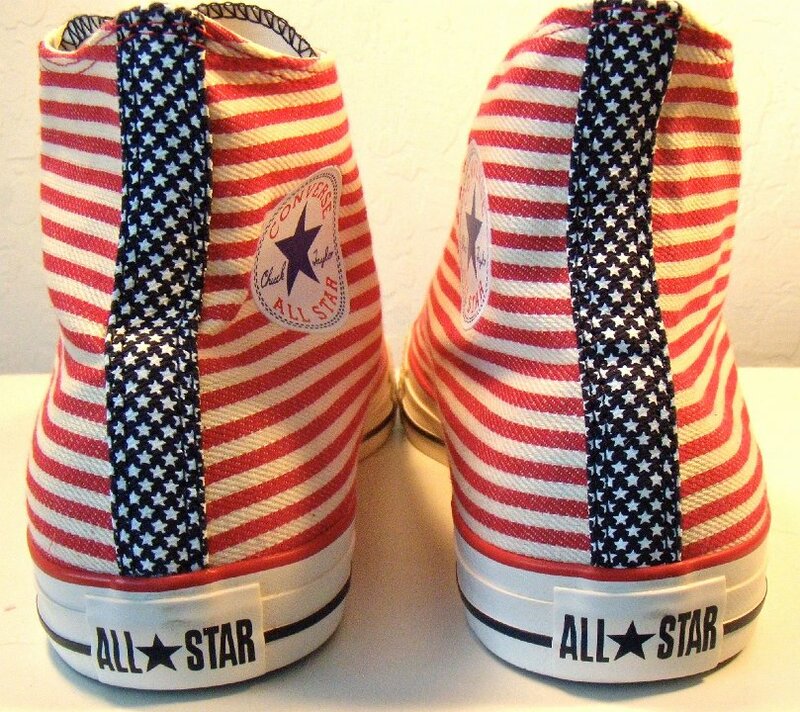 52 Flag Pattern Chucks Stars and bars high tops, top and right inside patch view. 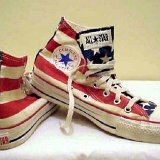 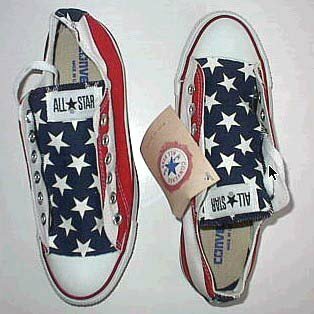 53 Flag Pattern Chucks Worn stars and bars high tops, inside patch views. 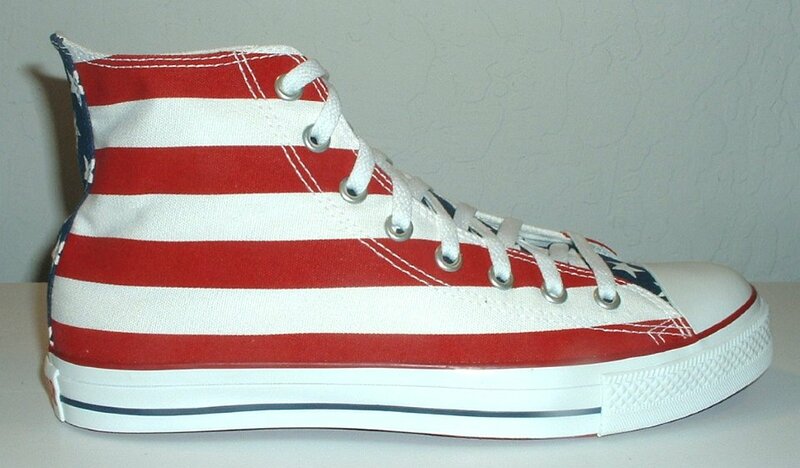 54 Flag Pattern Chucks Right stars and bars high top, angled outside view. 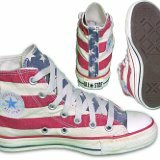 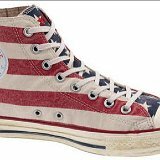 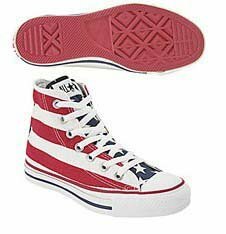 55 Flag Pattern Chucks Stars and bars high tops, outside and sole views. 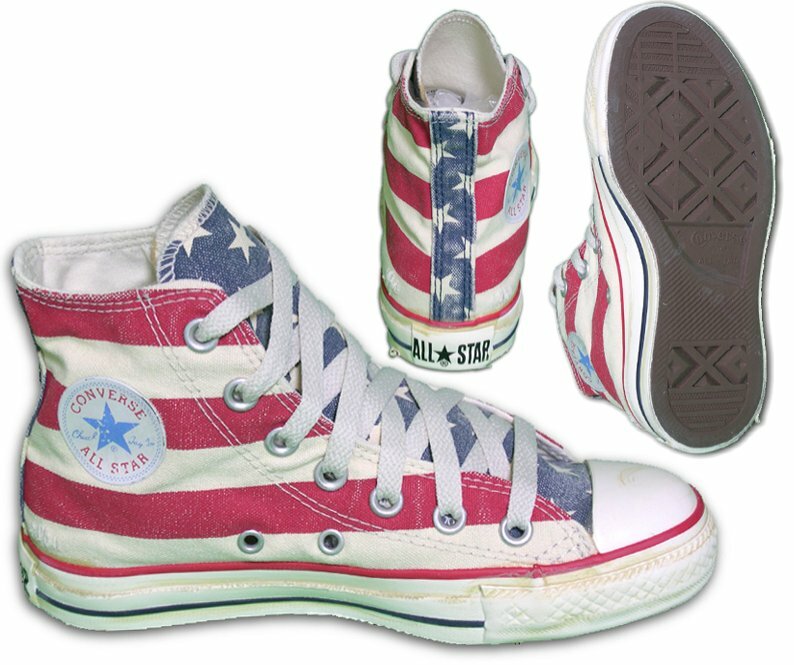 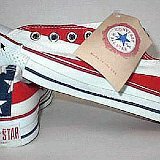 56 Flag Pattern Chucks Worn stars and bars high tops, rear and inside patch views. 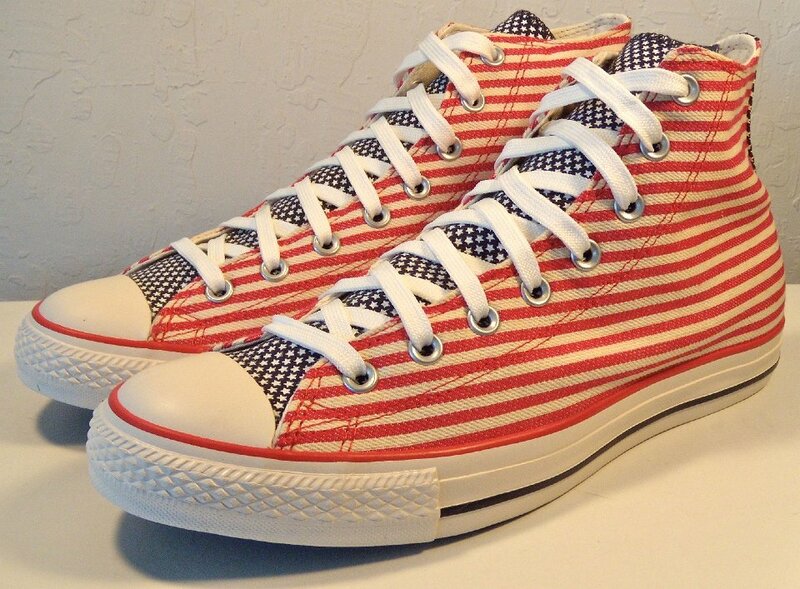 57 Flag Pattern Chucks Left stars and bars high top, shown in rear, front, and inside patch views. 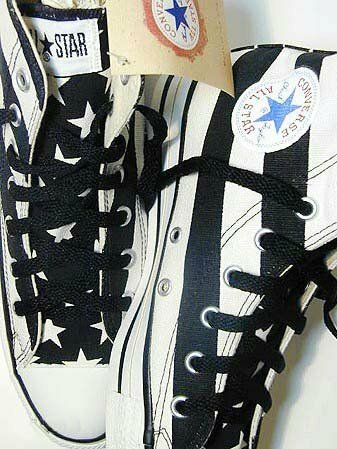 58 Flag Pattern Chucks Inside patch view of a left stars n bars high top. 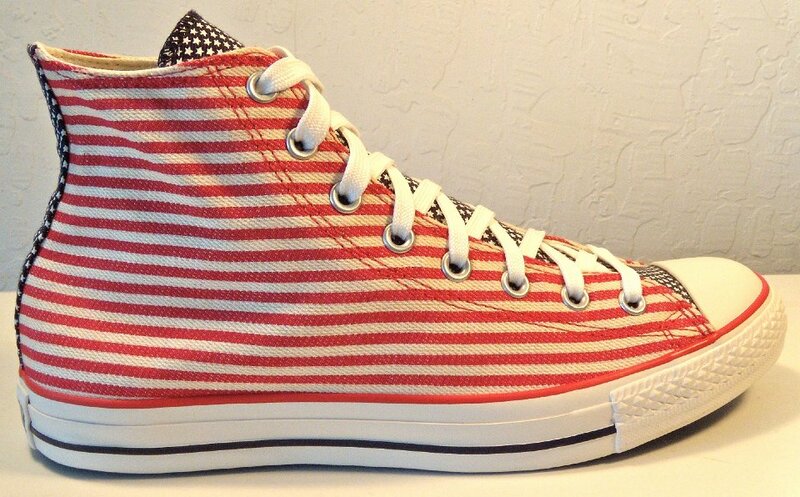 59 Flag Pattern Chucks Left stars and bars high top, inside patch view. 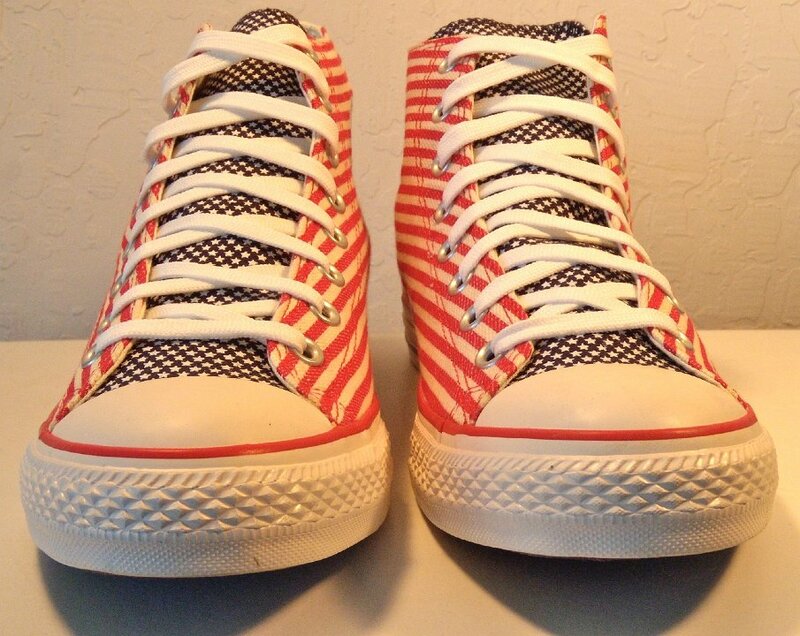 60 Flag Pattern Chucks Left stars and bars high top, outside view. 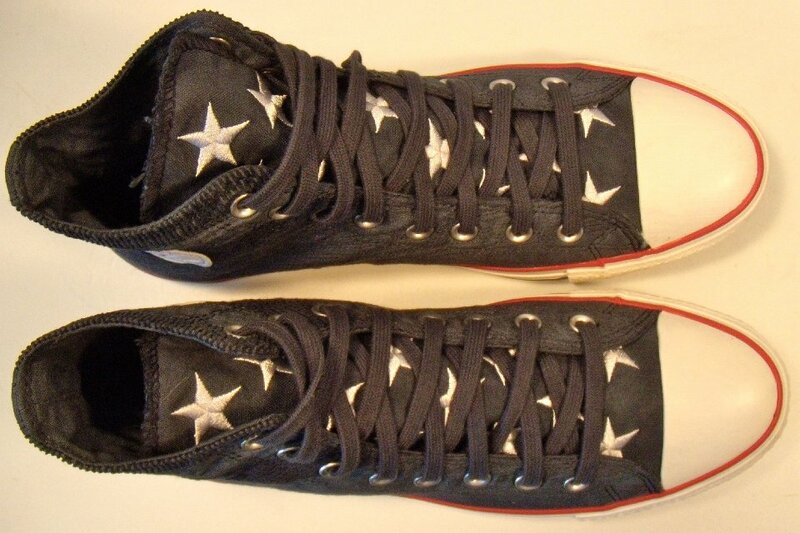 61 Flag Pattern Chucks Right stars and bars high top, inside patch view. 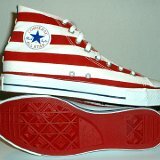 62 Flag Pattern Chucks Right stars and bars high top, outside view. 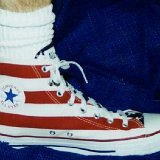 63 Flag Pattern Chucks Rear view of stars and bars high tops. 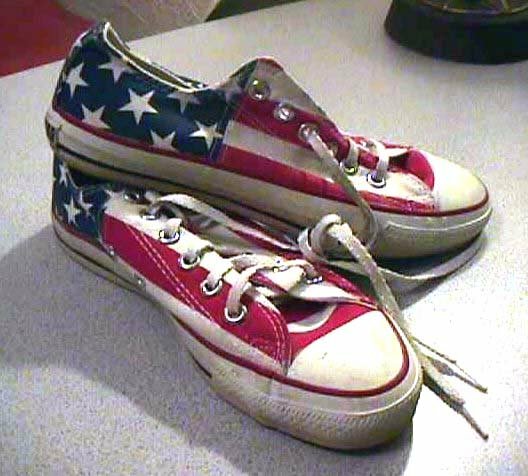 64 Flag Pattern Chucks Front view of stars and bars high tops. 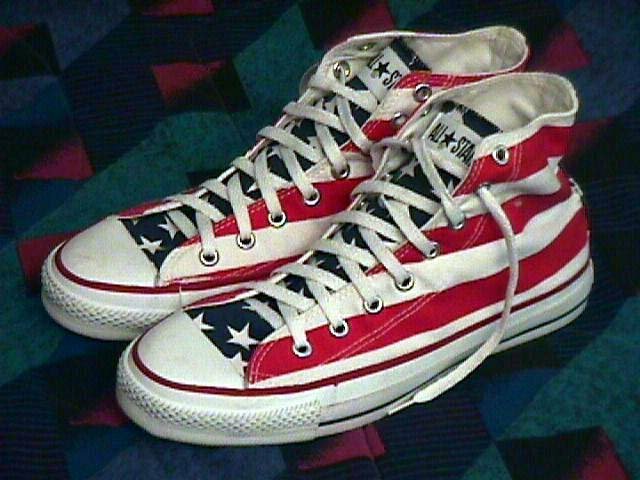 65 Flag Pattern Chucks Top view of a pair of stars and bars high tops. 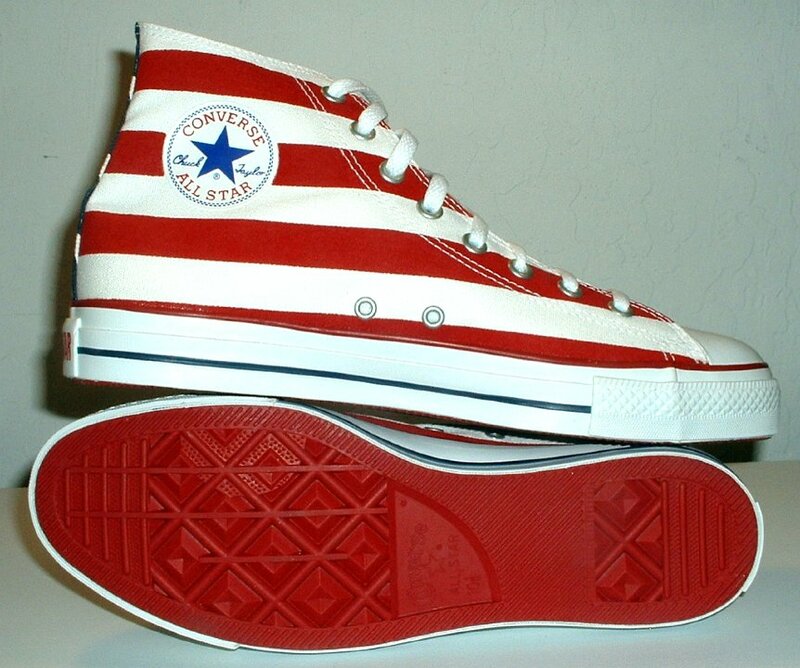 66 Flag Pattern Chucks Angled side view of stars and bars high tops. 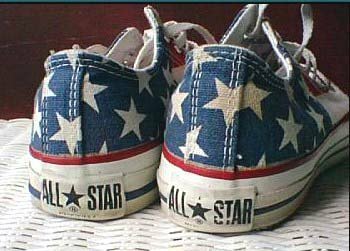 67 Flag Pattern Chucks Inside patch views of stars and bars high tops. 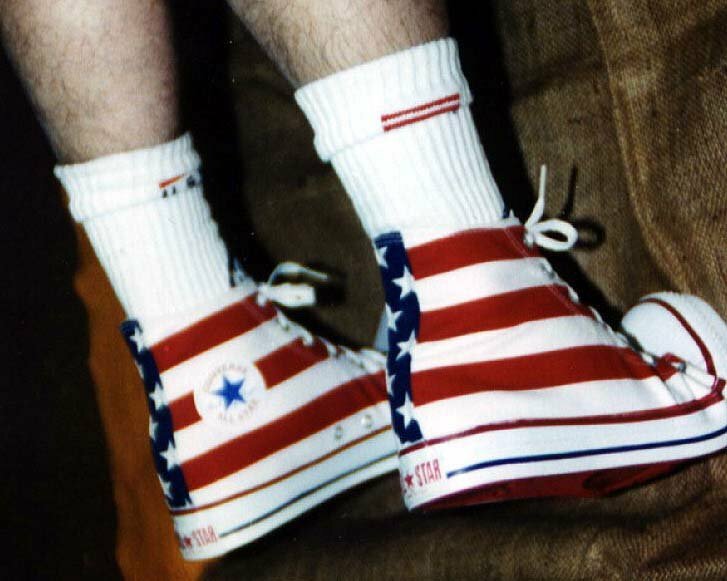 68 Flag Pattern Chucks Angled inside patch views of a pair of stars and bars high tops. 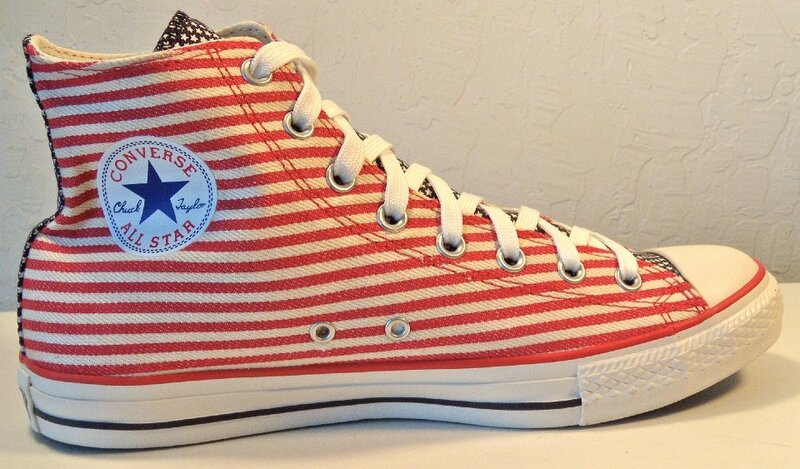 69 Flag Pattern Chucks Inside patch and sole views of stars and bars high tops. 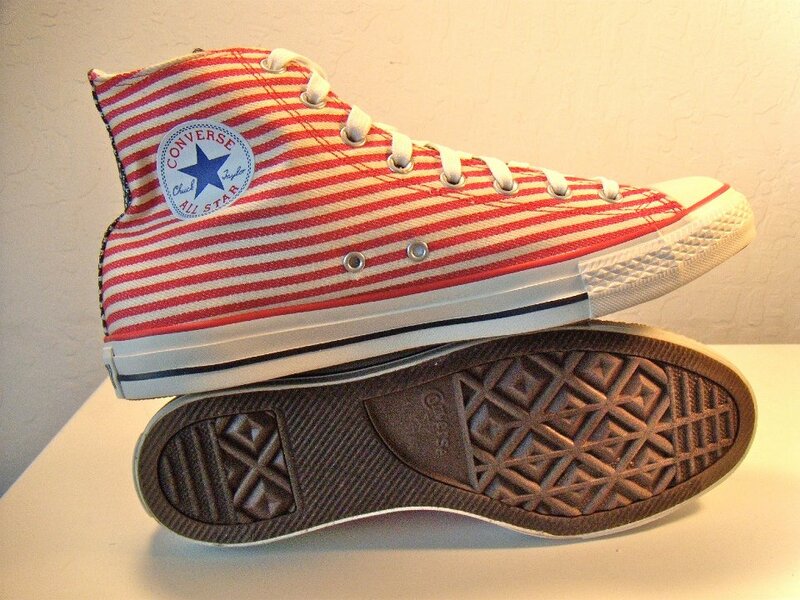 70 Flag Pattern Chucks Inside patch view of a left stars and bars high top. 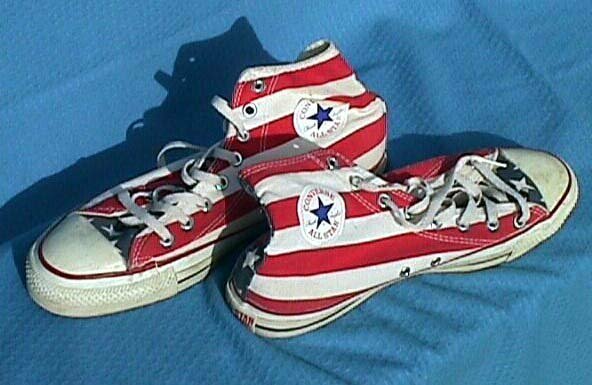 71 Flag Pattern Chucks Outside view of a right stars and bars low cut. 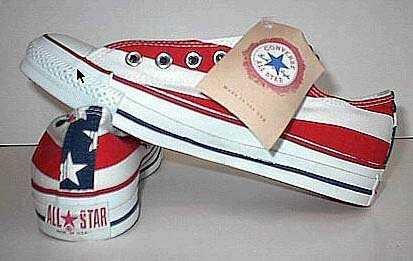 72 Flag Pattern Chucks Stars and bars low cut, top view out of the box. 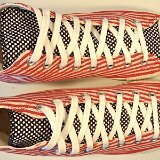 73 Flag Pattern Chucks Brand new stars and bars low cut, rear and side views. 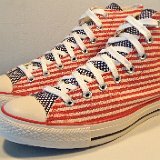 74 Flag Pattern Chucks Stars and bars low cut, close up of the toe caps and top. 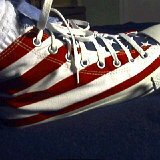 75 Flag Pattern Chucks Worn stars and bars low cuts, angled top view. 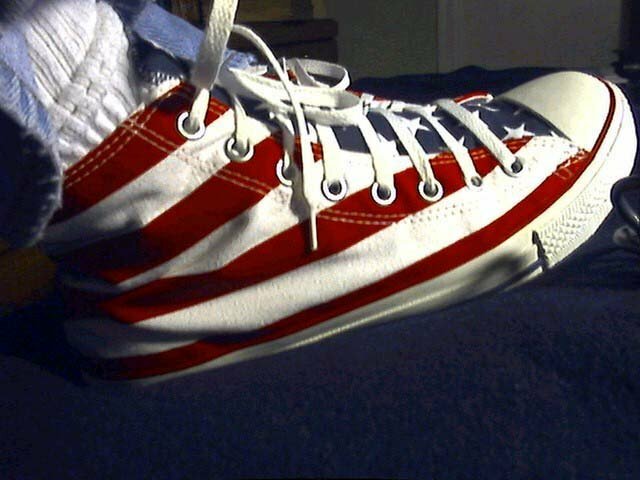 76 Flag Pattern Chucks Stars and bars low cut, side view. 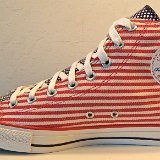 77 Flag Pattern Chucks Stars and bars low cut, top and sole views. 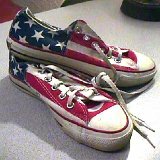 78 Flag Pattern Chucks Worn stars and bars low cut, made in USA older model with stars on the rear. 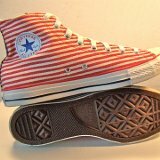 79 Flag Pattern Chucks Older model made in USA stars and bars low cut, side view showing stars and stripes. 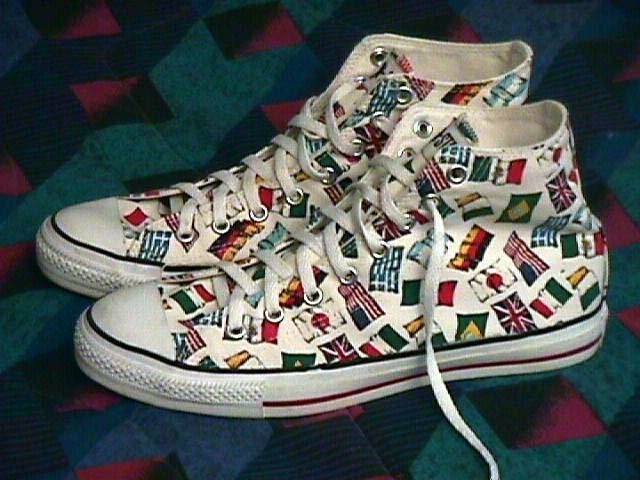 80 Flag Pattern Chucks Wearing international flags pattern high tops, top view. 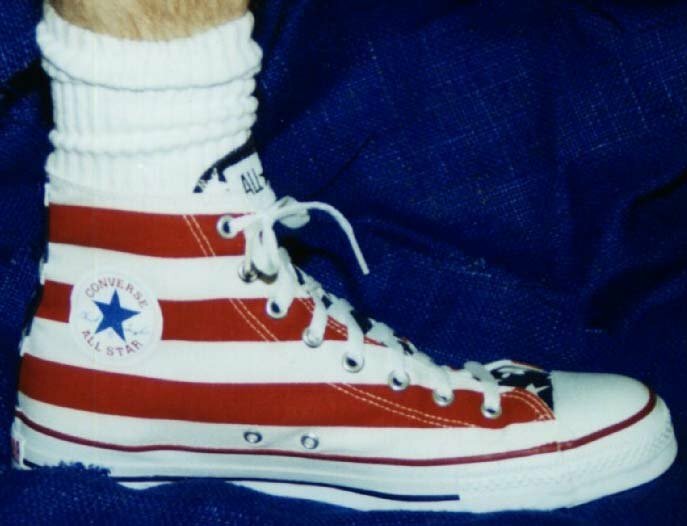 81 Flag Pattern Chucks Man in a patriotic mood. 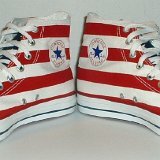 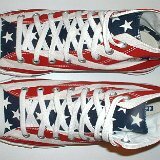 82 Flag Pattern Chucks Wearing stars amd bars high tops, front view. 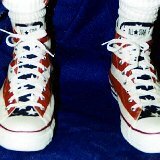 83 Flag Pattern Chucks Wearing stars and bars high tops, back and side view. 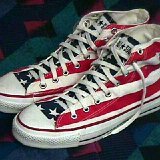 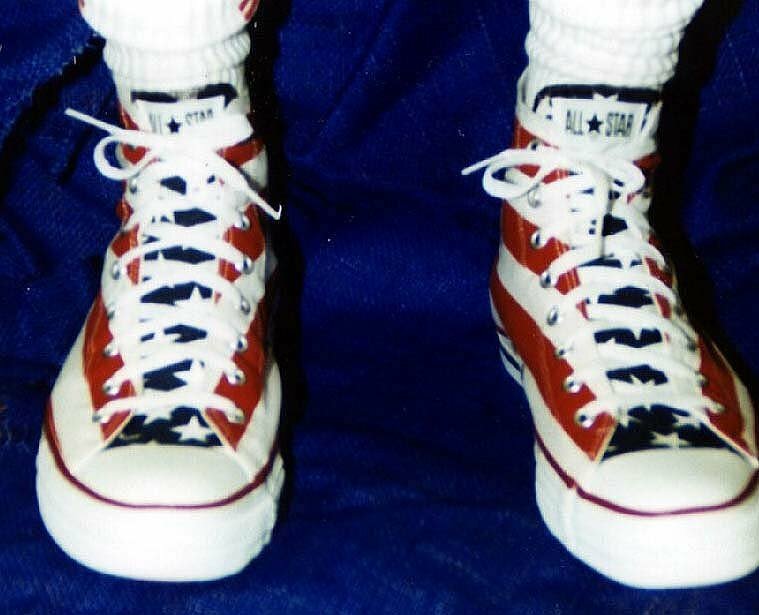 84 Flag Pattern Chucks Wearing stars and bars high tops, showing the left inside patch. 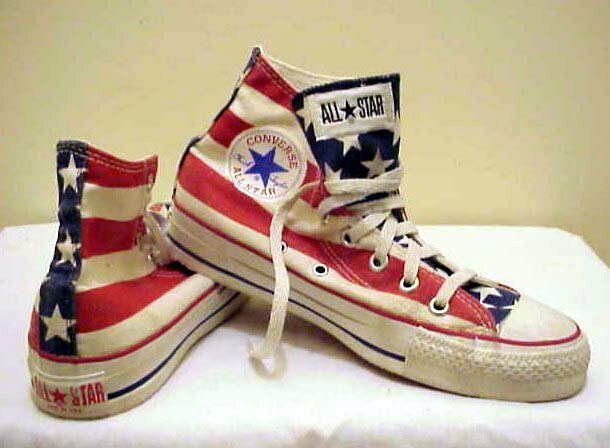 85 Flag Pattern Chucks Wearing stars and bars high tops, right outside view. 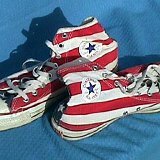 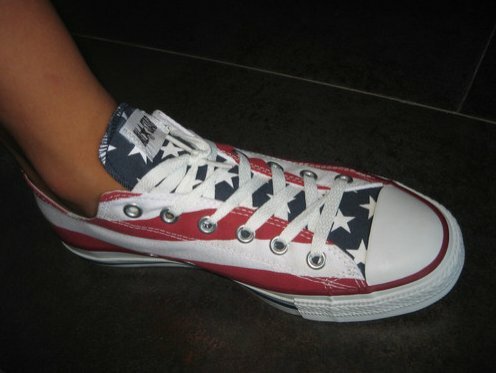 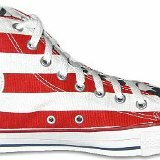 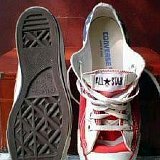 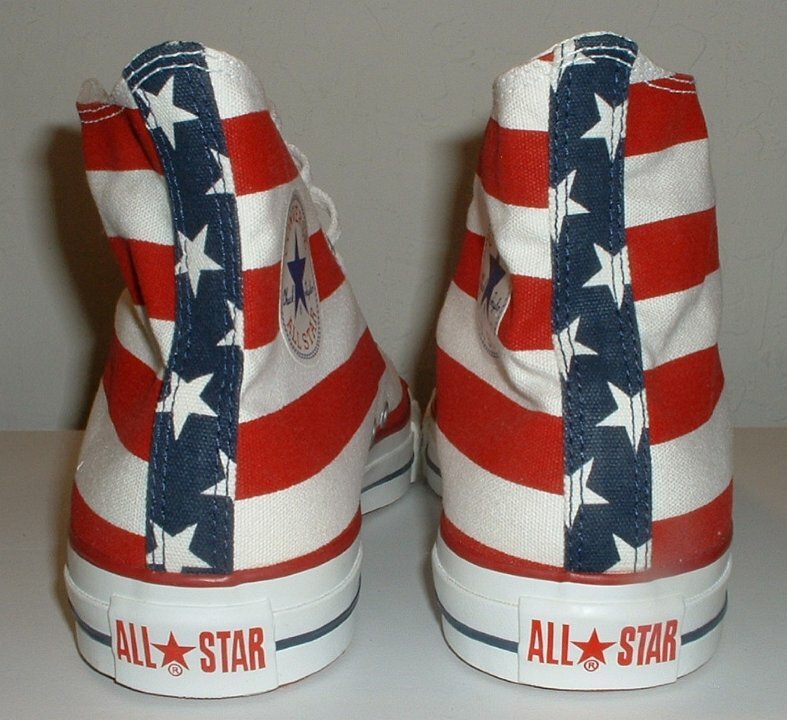 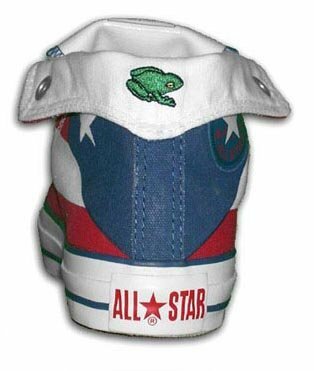 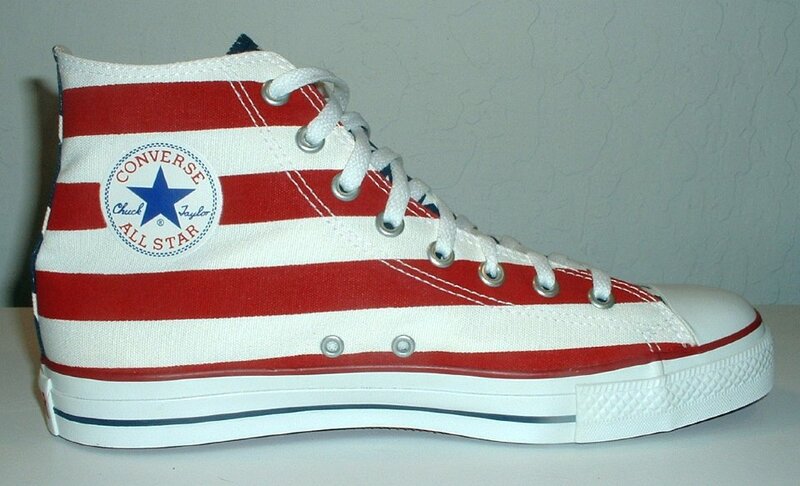 86 Flag Pattern Chucks Wearing stars and bars high tops, top view. 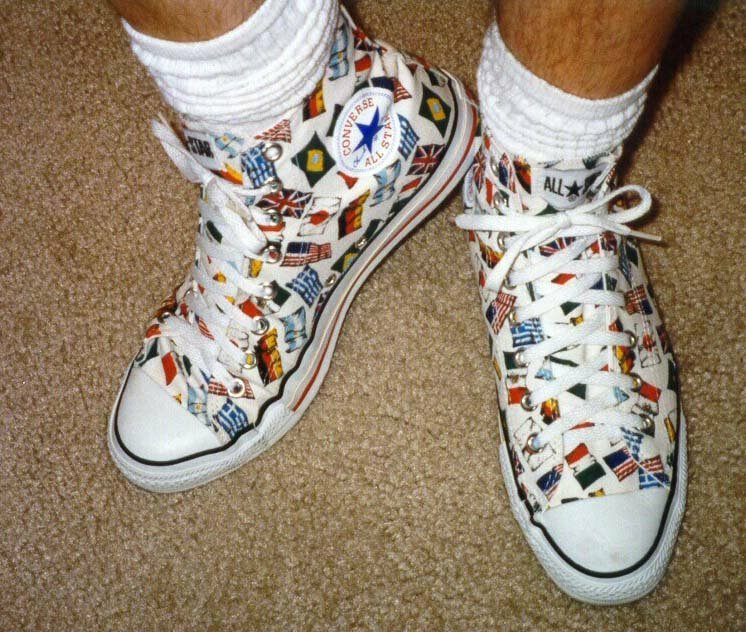 87 Flag Pattern Chucks Wearing a left stars and bars low cut chuck. 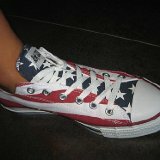 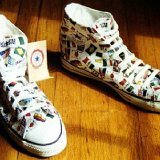 Flag Chuck Taylors are special print canvas patterns that feature flags of the Americas and the world. 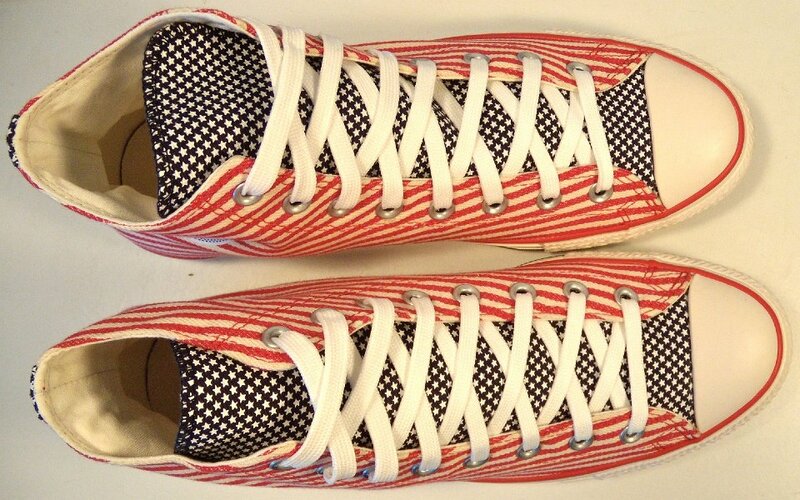 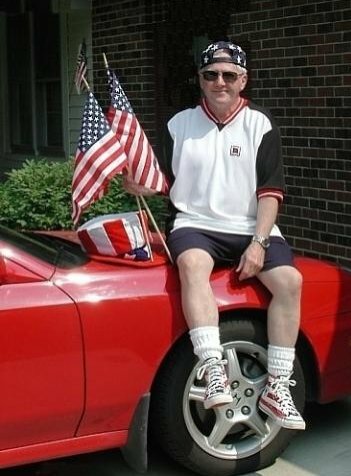 The stars and bars model uses patterns from the American flag and epitomizes the patriotic American sneaker. 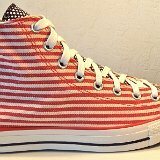 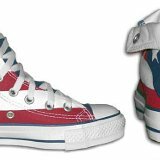 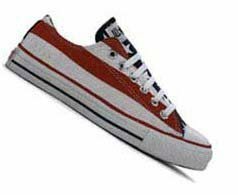 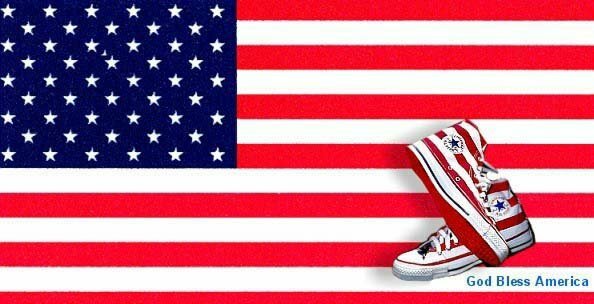 Stars and Bars pattern canvas chucks are available in high top and low cut models and feature a red and white striped pattern on the sides, and a blue and white stars pattern on the tongue and back seam. 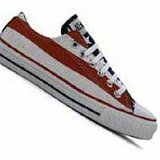 The shoes have red piping and and a blue stripe on the sides of the rubber soles. 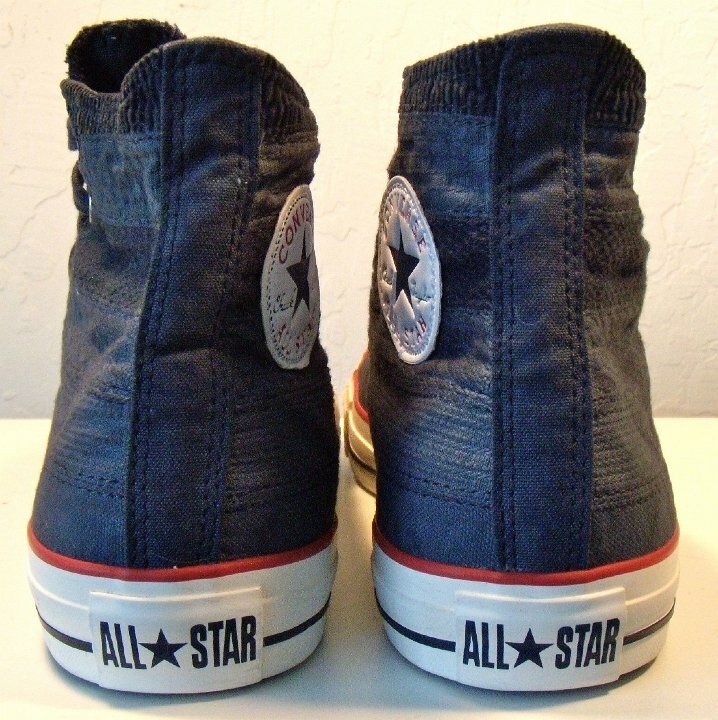 The bottoms of the soles are bright red and the All Star patch on the back is also red. 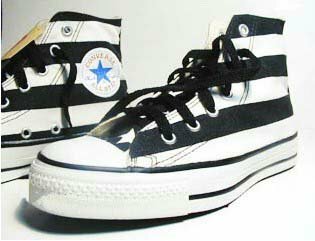 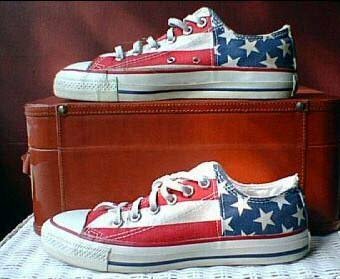 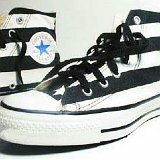 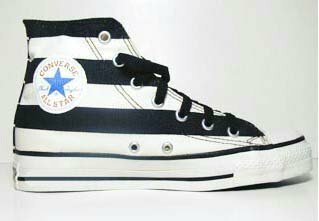 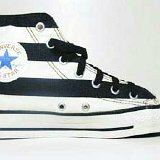 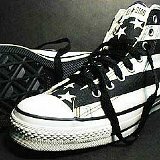 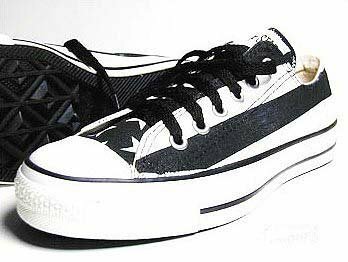 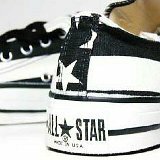 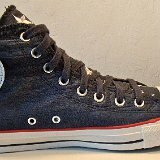 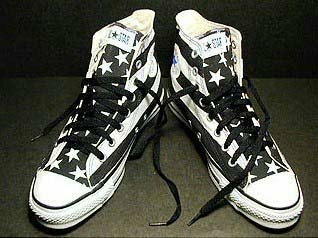 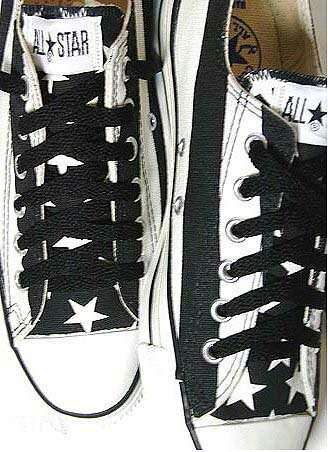 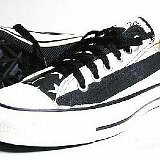 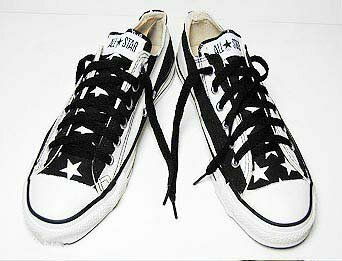 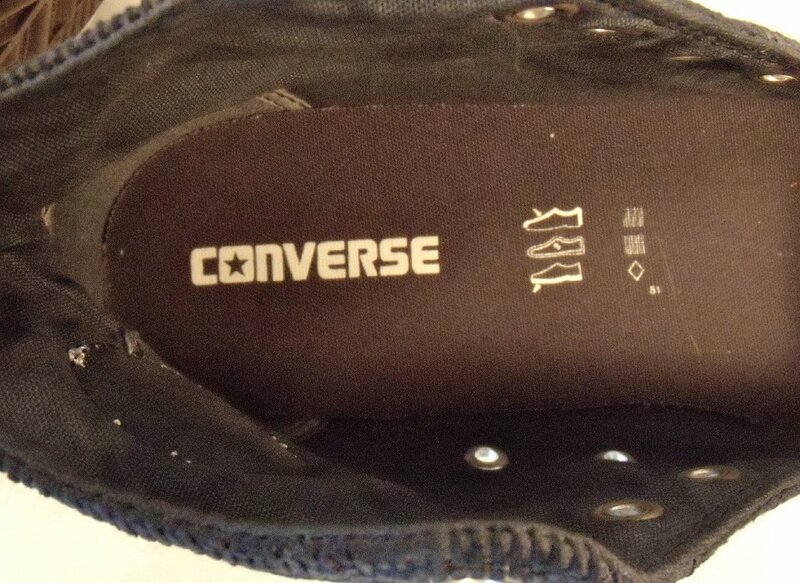 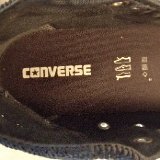 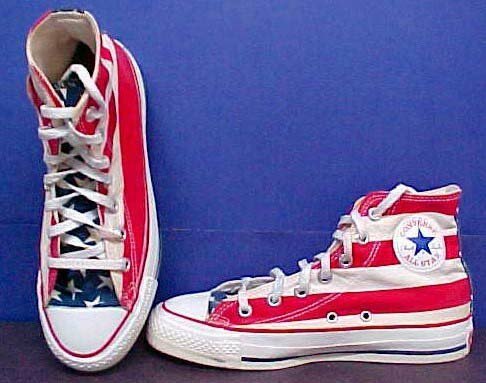 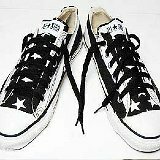 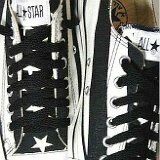 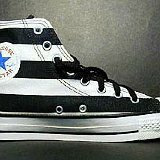 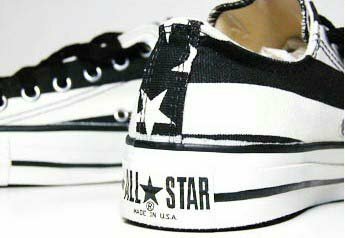 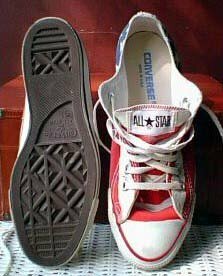 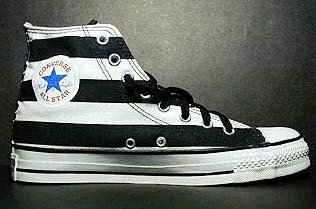 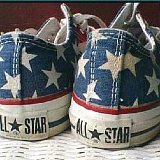 Stars and bars were also manufactured one season in a black and white version and in 2006 Converse issued a "rummage" version with a worn look. 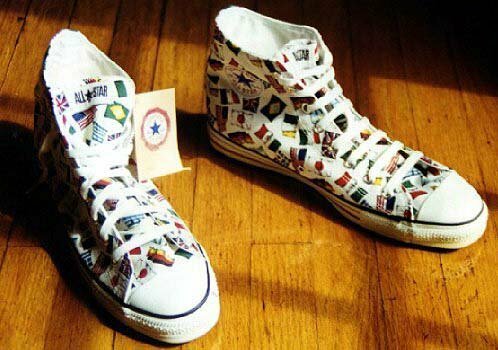 Another seasonal flag print by Converse featured the flags of the world. 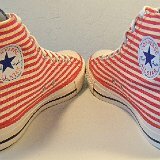 The print is on white canvas, with green piping and a red stripe on the rubber soles. 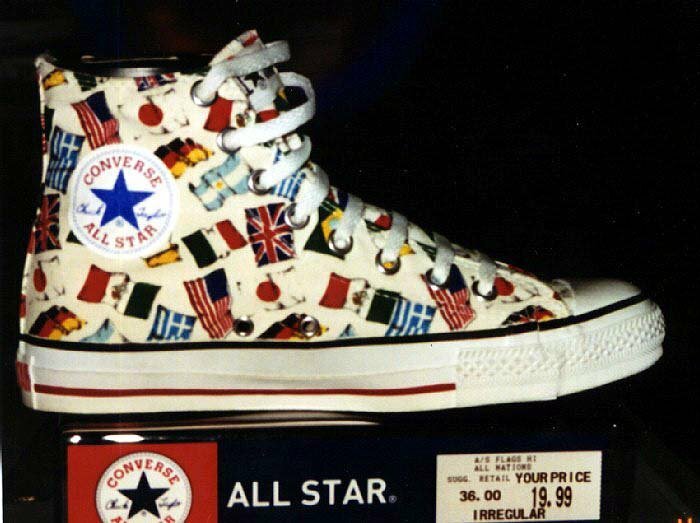 In 2003, two foldover high top models featuring the Puerto Rico and West Indies flags were issued. 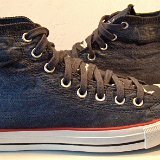 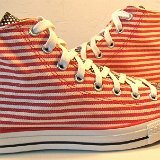 In 2012 Converse issued a line of Americana chucks, the blue flag and red striped patterns in this gallery.